I began doing Readings when I was 15 years old. I remember. I was working at what was then Lechmere in The Woburn Mall...a rather pitiful mall in Woburn, MA. They had a "Psychic Fair" one week. It was hosted by the late Ramona Garcia of happy memory. My God I was hooked! I just Loved it. I was fascinated with the cards and their symbols...that the future could be known! That one could know things psychically about another! I bought my own Tarot Deck and took my new cards to high school. I was a sophomore. I honestly thought I was making things up to tell people. These images and ideas would pop into my head. It just so happened I was spot on. Well, word got out and everyone in Woburn Senior High School wanted a Reading. The year was 1988. And I figured since I was gonna be doing Readings, I may as well charge! It was $5.00 a reading and I had a small line at my lunch table in the High School cafeteria. I went home with $45.00 that day! I knew then I wanted to do this for the rest of my life. Not a year later, I met a charming fellow at a party. He showed me how to perform "Mediumship Readings". That is, speaking about those who have passed on to the other side; Guardian Angels; Saints; GOD! He guided me in the paths of Mediumship and Astrology. Further down the road I met Witches and Wizards who trained me in the Arts of Magick. Well, who guided me anyway. All real studying was ultimately done by me. And there was a lot of trial and error. ...and on. It wasn't until December of 2010 that, out of nowhere, my Readings took off! As though The Universe knew I was ready after 22 years of training. I appeared on WZOU Boston, JAMN 94.5FM, Mix 93.1FM, even The Glenn Beck Program! I was featured in the Boston Globe and Salem Evening News. Yet, what put me "on the map" were my annual predictions. I would go on radio every early January, and cast 30 Prophecies for the year. Well, they had me back every year after that! Why? Because I was right. I am real. But how do you distinguish the real Psychics from the frauds? The city…Boston. That’s 50% (although, considering the number of cities in the US, I should be given more credit!) Then I predicted the type of event. Tragedy & Terror. 25% chance now. I predicted the time. Late April. 12.5%. I predicted a direct, local result. Economic depression in the Back Bay. 6.25%. I predicted where the perpetrators would be caught. “The city submerged in water”. They were captured/killed in Watertown, MA. I had a 3.125% chance of being correct…and I was. Friends, you can’t GUESS like that. After years of documentation, my worst year of accuracy was 74.4%. My best was 96.6%. "Having then gifts differing according to the grace that is given to us, whether prophecy, let us prophesy according to the proportion of faith"
Noah, Abraham, Jacob, Moses, Joshua…All built "Altars unto the Lord". Even Joseph had a “Divination Cup”. I’ve been doing this for 30 years now. So, I am asking you to take a leap of faith…and to trust me. EJ Johnz has been a user of Keen since 2010. 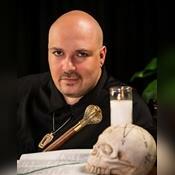 Getting Tarot Readers advice from EJ Johnz through www.keen.com is safe, secure and confidential.